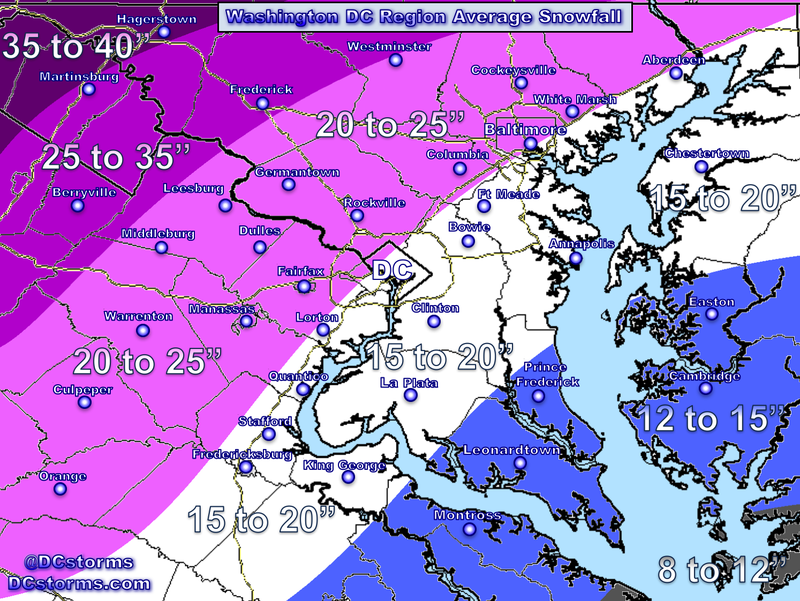 Notice in the bottom graph that the *current* ensemble mean snowfall prediction for Reagan National Airport is 16″. 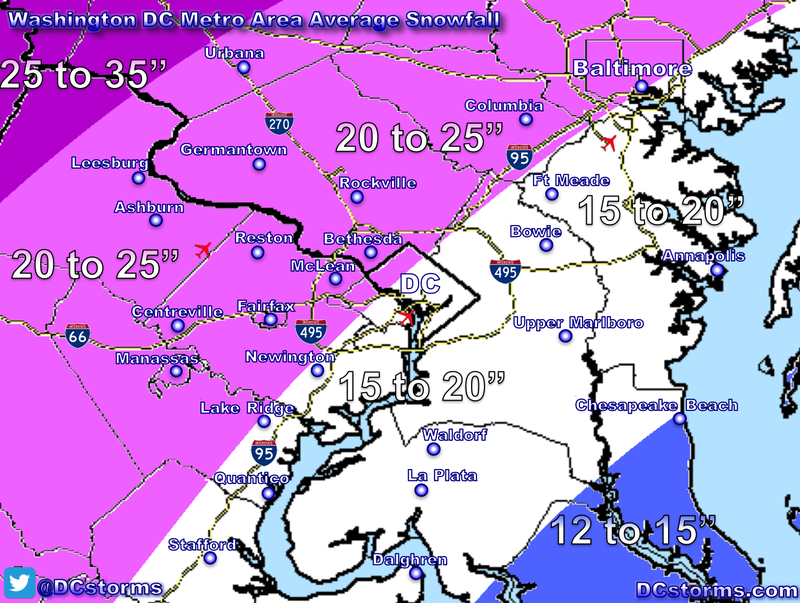 If this were to verify on Saturday (remember these can change as more data comes in tomorrow) this would be DC’s largest snowstorm since February of 2010. One of my goals on this site is to inform the public of potential significant weather. Bottom line is until I issue a final snow map, I am not making a call. What I am tired of if flipping on the news and hearing “we have the potential for a big storm” without discussing potential impacts in something that the public can quantify (ie: potential snowfall accumulations). Good Grief. More updates to come tomorrow afternoon/evening after I look at the latest data. 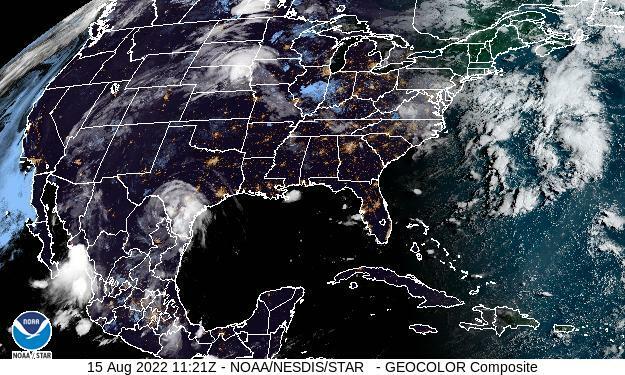 Thanks for all the work; looking forward to your final prediction and all the chaos that ensues when such storms do occur. Oh please bring it on! This might make up for the horrible winter thus far this year. I depend on snow throughout the winter, with a few big ones. I thought after the “hot” Christmas, that would be the trend all winter, even after all the sites I read for winter predictions for our area. This is just what we all need for a winter boost! I have some gripe with forecasters making it sound that there is a significant chance of nothing. Sure, stranger things have happened, but you are doing the public a disservice by giving them false hope that they still might be able to conduct business as usual on Friday and Saturday. At least forecasters should indicate the probability of a major snow event, as you are with good common sense. There is still plenty of time to call off the dogs if need be. Your my go to guy for snow predictions,i hope it lets loose!! !